SALTILLO, Mexico - On a hilltop along the edge of this northeast Mexican city, row upon row of tiny stucco homes are sprouting. They are being erected on orders of the federal government, which envisions an influx of families from distant pueblos looking for salvation in the booming automotive industry. Driving into town, workers are greeted by a gargantuan, American-style mall with a Walmart, Nine West and a Liverpool department store that invites customers to shop now and pay later, a rather new concept in this country. To the north, in Ramos Arizpe, the Universidad Tecnologica de Coahuila is training the next generation of skilled auto workers as plant technicians and engineers for Big Three companies like General Motors and Chrysler, or suppliers like Magna International, which have sprawling plants in the region. They are learning English, and even French, in hopes that they will someday work side-by-side with their automotive counterparts in Detroit or perhaps Canada. Twenty years after passage of the North American Free Trade Agreement, known as NAFTA, the auto industry’s rising presence in Mexico has helped bring many of the totems of middle class life to growing manufacturing cities like Saltillo, which are now often described as little Detroits, for better or worse. Inside the state-run university labs, students use equipment donated by the plants operated by U.S. automakers, who are betting these students will one day work for them. Students like Ernesto Gonzalez, 22, of Saltillo, who said he is about to start an internship with Magna. Since NAFTA’s passage, vehicle production in Mexico has tripled, from 1.1 million in 1994 to a projected 3.2 million vehicles this year. Increased exports mean the industry now accounts for more than 20 percent of foreign receipts. Mexico’s auto growth is not just from NAFTA, far from it. Mexico now has trade agreements with more than 40 countries, with European and Asian manufacturers building auto plants across Mexico. Mexico’s rising auto fortunes were solidified earlier this year when its production surpassed that of Latin American rival Brazil. Auto industry analysts predict the trend to continue after manufacturers like BMW announced plans to invest $1 billion in a plant in the central Mexican city of San Luis Potosi that will build 150,000 new vehicles a year starting in 2019. The German automaker follows Honda and Mazda, both of which opened plants in the south central Mexican state of Guanajuato earlier this year. “The auto industry in Mexico is just booming, it's taking off right now and it´s probably the industry in which Mexico is the most competitive,” said Christopher Wilson, a senior associate with the Mexico Center at the Woodrow Wilson International Center for Scholars in Washington, D.C.
Wilson and others say Mexico’s ascension is a combination of low labor costs, a shift to an export-based economy in which 80 percent of vehicles produced in Mexico go to the powerful U.S. market, a well-defined NAFTA corridor, and modern factories that are more efficient and safe. An influx of banks has provided workers with greater access to credit. “It´s gotten to the point where you really have this pipeline of investment in Mexico that includes just about every major manufacturer in the world,” said Wilson, who leads research and programming on regional economic integration and U.S.-Mexico border affairs. But Mexico’s fast-rising Motor Cities are still vulnerable to the pitfalls that Detroit has faced as consumer trends shift and the global auto market becomes ever-more competitive, with companies continuing to search for the cheapest and most efficient source of labor. And for all of Mexico’s trade gains with its U.S. and Canadian partners, NAFTA has yet to produce a significant boost for Mexico’s overall economy. "Most studies after NAFTA have found that the effects on the Mexican economy tended to be modest at most," a 2010 Congressional Research Service report found. Unemployment is actually higher in Mexico than when NAFTA passed, and efforts to reduce poverty have moved slowly compared with other Latin American countries. Mexico’s per capita income remains under 20 percent that of the U.S. The government moved to privatize over 1,000 government-owned enterprises and open its economy. By the late 1990s, pushing the export model helped Mexico climb out of debt and the automotive industry was the one ticket out of it. NAFTA created the largest free trade zone in the world, easing tariffs and freeing up trade between the United States, Canada and Mexico. Brushing aside labor objections, President Clinton predicted NAFTA would create 200,000 jobs for Americans in the first year alone, on the premise that as demand for American exports rose, so too would the overall economy. Two decades later, there is little consensus on NAFTA’S legacy. Trade among the U.S., Mexico and Canada has increased, while promised U.S. jobs failed to materialize. And the products being exported are increasingly likely to be produced in Mexico and shipped back to the U.S.
Products made in places like Saltillo. Tereso Medina Ramirez, president of the Confederation of Workers in southeast Coahuila, the largest union in the state, noted that before NAFTA Saltillo was a small city known more for its colonial architecture and ceramic tiles. In 1980 Medina Ramirez got his first job in the auto industry when GM opened a plant there. A few years later, Chrysler followed suit. By the late 1990s, Saltillo was booming and companies became desperate to find workers, even searching other parts of Mexico to recruit. 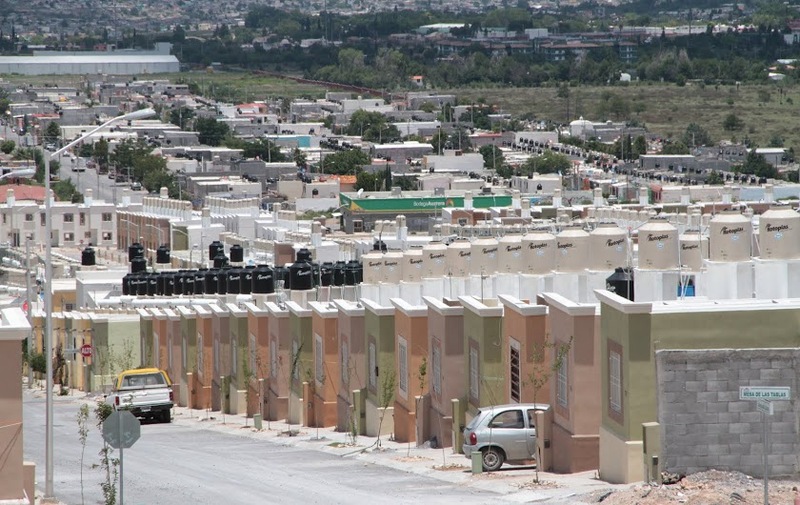 Under a federal loan program to help workers buy homes, known as INFONAVIT, some 10,000 workers from the southern Mexican state of Veracruz migrated to Ramos Arizpe, the suburb north of Saltillo. To lure more auto business, the government opened the Universidad Tecnologica de Coahuila in 1995. University officials went directly to U.S. automakers and their suppliers to learn their needs and adjust the school’s curriculum accordingly, said university president Raul Martinez Hernandez. In return, the companies ensured that students would be paid for on-the-job training and receive jobs upon graduating. “We have to know for sure that the students are going to get work after they leave,” Martinez Hernandez said. Students attend classes at UTC for two years to become plant technicians, spending four months at a time in workshops to learn how to use equipment that they would find in any automotive plant. They spend another four months working full-time at nearby factories. During their first factory stint, wages are paid directly to the university, which in turn pays for students’ health insurance and contributes to the IMSS, Mexico’s equivalent of Social Security. Martinez Hernandez said about 80 percent of graduates go on to work in local auto factories. Five years ago, UTC added an engineering program, admitting 3,000 students a year. Students must complete the two-year technical curriculum and work full-time on factory assembly lines for a year before returning to pursue engineering degrees. A majority of those in engineering continue to work full-time. On average, technicians take home the equivalent of just over $900 a month. Engineers, roughly $1,200. Experts predict continued growth for Mexico’s auto factory towns, but some worry that cities like Saltillo are taking the wrong approach to attract global companies, while ignoring smart city planning. Onesimo Flores Dewey, a lecturer in urban planning and design at the John F. Kennedy School of Government at Harvard, is originally from Saltillo. Though the increased presence of global manufacturing companies has brought stable, well-paying jobs to the region, he fears Saltillo is becoming too dependent on the automakers’ success. Before NAFTA, when Mexico’s economy was closed, auto companies were required to work with locally-based suppliers, Flores Dewey said. This created an incentive for local governments and business leaders to work together to ensure urban development had the necessary infrastructure to go along with it. Now, “there are very few independent voices pressuring the government to properly support public works projects,” he said. So developers are building neighborhoods in the outskirts of town, which means freeways for workers to commute and a more car-focused lifestyle than Mexican families are accustomed to. “It’s like they’re trying to replicate a Houston or a Los Angeles,” Flores Dewey said. Some neighborhoods are experiencing abandoned housing and crime as waves of families who took out the government-subsidized INFONAVIT loans end up walking away because they can no longer afford their mortgage. Jorge Hinojosa lives with his wife and three children in one such subdivision on the southern limits of Saltillo. He works for automotive supplier Magna International Inc., where he earns just over $500 a month. About a third of that is automatically deducted to pay his INFONAVIT loan along with a government line of credit for his furniture – known as INFONACOT. After taxes and Mexico’s version of Social Security, the family lives on roughly $125 a month. Most INFONAVIT homes in the newer Saltillo subdivisions aren’t completely finished when they go on the market. On one afternoon in July, it was easy to walk into new developments surrounding Hinojosa’s neighborhood for a self-guided tour. The structures are maybe 800 square feet, with one or two bedrooms. They come with no doors, windows or insulation. Those must be bought by the homeowner after the house is sold, often through the INFONACOT loans. Several showed evidence of trespass; empty beer cans and chip bags littered concrete patios. Others were covered in graffiti – abandoned before they were even occupied. When Hinojosa bought his home 10 years ago, it had one bedroom and he had two children who were still toddlers. When the third child arrived, Hinojosa began remodeling, starting by converting his driveway into a living room and then adding a second floor, where there were to be three bedrooms. “But I have no money to finish,” Hinojosa said. The second story remains inaccessible; Hinojosa has not yet installed a staircase. Magna gives employees paid vacations, but Hinojosa can’t afford to take his family on trips. Instead, he uses his vacation to work in construction, helping build more INFONAVIT homes. He owns a pickup truck, but it doesn’t work. Like many of the other tens of thousands of auto workers in the region, he takes a company bus to the factory. Hinojosa says he doesn’t know what he would do if Magna were to relocate. With only a high school degree, he must compete for jobs that look to UTC for more highly-skilled applicants. And he already knows the risks of working for a global company to provide for his family. Before Magna, he worked at a Coca Cola plant. When the factory relocated to Monterey, about 90 kilometers to the east, he was out of a job and forced to work construction. Like Detroit, Saltillo stumbled when GM and Chrysler entered bankruptcy. Production halted at U.S. auto plants in Mexico for six months. The Confederation of Workers negotiated to get employees 50 percent of their pay during the production shut down. Once they returned, they were forced to take deep pay cuts to keep the jobs in Saltillo. Medina Ramirez said he recognizes that relying too heavily on one industry leaves the region vulnerable to the same fate as cities in Michigan like Detroit, Greenville or Hamtramck, that were left staggered by auto plant closings. He recalled that when work at the GM plant halted, the union and Mexican government officials urged appliance companies like Benton Harbor-based Whirlpool to relocate there. Now 6,000 workers in the Saltillo area work for appliance manufacturers, including Whirlpool. Another 8,000 work for steel companies. As as result, the percentage of automotive workers in the region has dropped from 80 percent of the workforce to 60 percent, Medina Ramirez said. Serena Maria Daniels is a 2014 Ford Fellow at the International Center for Journalists, where she is reporting on the impact of NAFTA in Michigan and Mexico. She has worked at the Detroit News, Chicago Tribune and Orange County Register. Support for this project comes from the International Center for Journalists. Mexico is not reaping the benefits of NAFTA because the manufacturers who moved there continue to pay substandard wages to the persons that they employ. Your article states that per month, Workers make about $500, Technicians $900 and Engineers about $1,200. That equates to about $3.13, $5.63 and $7.50 for those workers. The whole push behind NAFTA was to allow manufacturers to move there without having to pay tariffs when the goods came back into the country. The thing that all of those manufacturers have never bothered to recognized, is that if US citizens do not have decent jobs, they will not be able to purchase the goods that they have for sale. Just like H. Ross Perot, I still hear that giant sucking sound. Cindy is right on but lost the perspective of Unions that drove the companies to seek compeitive wage scale with the imports that consumers so desired. GM tried a JV with Toyota in CA that failed. Ford lasted for quite some time in a JV with Mazda but gave up on that now also. Both companies gave up their parts manufacturing phased out to Delphi and Visteon offshoots. That move alone allowed them to transition over 100,000 non competitive UAW jobs. Many of Detroits auto market share and jobs went to the "transplant" auto companies in "Right To Work" States and mostly non-union jobs. Add to this the many Federal and State regulations on these companies here plus the highest corporate tax rates in the world and you have a mix for failure. These companies had to make moves to Mexico and other countries for parts or simpy die. GM and Chrysler almost passed away in this last recession. Ford was likely not far behind but had taken actions earlier to sustain the company. NAFTA is only part of the story. It is significant but little has been done by our governments to encourage growth and job creation here in the U.S.A. . The only very limited act recently is to expose some companies that are moving offshore for tax advantage. They just don't get it that they need laws to protect our business and jobs. OK, give them credit for the "bail out" but then they all just went silent on any longer term actions to support this business. You have not discussed what NAFTA has done to put Mexican small farmers out of business and make some convert to becoming mules for drug smugglers and undocumented immigrants to the U.S. and other Central American countries. U. S. subsidies for ag commodities, especially corn, and export enhancement subsidies combined with NAFTA to help. Duck, if moving to Mexico to escape the UAW, how come the U.S. is in such bad shape? All it did was make the rich, richer! The U.S. should eliminate all taxes on corporations that stay or come back to the U.S. Follow our regulations, labor laws,etc. If you still over seas, place a tariff on the products. Do this for any part (ex. For a car), place a tariff on it. Free trade is not free.